is a big, handsome, white & tabby cat. He weighs in at 24 pounds, and that's after a diet took 2 pounds off! The only thing he loves more than eating is sitting on people's laps. 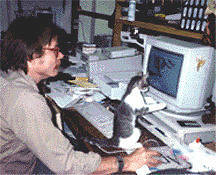 Ralph de Ralf wasn't a cat I wanted, at least not at first. I was walking to work one night (I live in a small town where this is still safely possible) and I heard a frantic mewing coming from a tree in the park. There, about six feet off the ground, was a white and grey bundle of fur insisting that someone get him dowwwwwnn nowwwww!!! I did and took him to work with me where he briefly became the newspaper cat. The rambunctious kitten (he was about eight weeks old) won a lot of hearts. He also knocked over a lot of coffee cups, scattered paperwork with glee, and supervised work being done on the computers (especially by my brother Hop). I soon decided he shouldn't be left at the office over the week-end and took him home to meet Laura (RB). The result was instant war... they hated each other. One day, just as I was about to give up, I walked in the room to find Laura assiduously grooming a purring Ralph. They' were pseudo-siblings for ten years and Ralph, in a show of brotherly devotion, quit his newspaper job to stay home and keep her company. Soon after I found Ralph, I put an ad in the paper. He was a friendly little fellow and I was sure he belonged to someone. Two different couples stopped in, looked him over, and proclaimed him to be a kitten they had rescued and who had run away. Neither couple was interested in getting him back, too hyperactive and destructive they said. He's still a destroyer, one of those cats who loves to knock things off shelves one at a time, and he has a extraordinary talent for opening doors, drawers, and even bottles, but he's never run away from this home. I'm glad, because he's also my cuddle cat and I'd be lost without him. 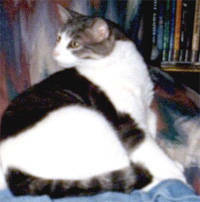 Laura went to the Rainbow Bridge in July 2004, shortly after Fred joined our household. Ralph is now finding out what it's like to be the "old" cat. Now, wut key du I step on tu tawk tu hur? Through the news group rec.pets.cats.community, Ralph has found love. 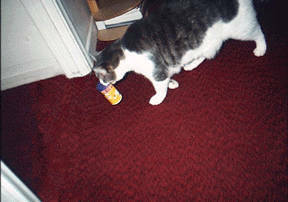 His wedwink is named Kissa, which is Finnish for cat, and she has her own web page. Her human made this button for them. He's also a soomo ressler in the rpcc under the name of Da Ralphinator.